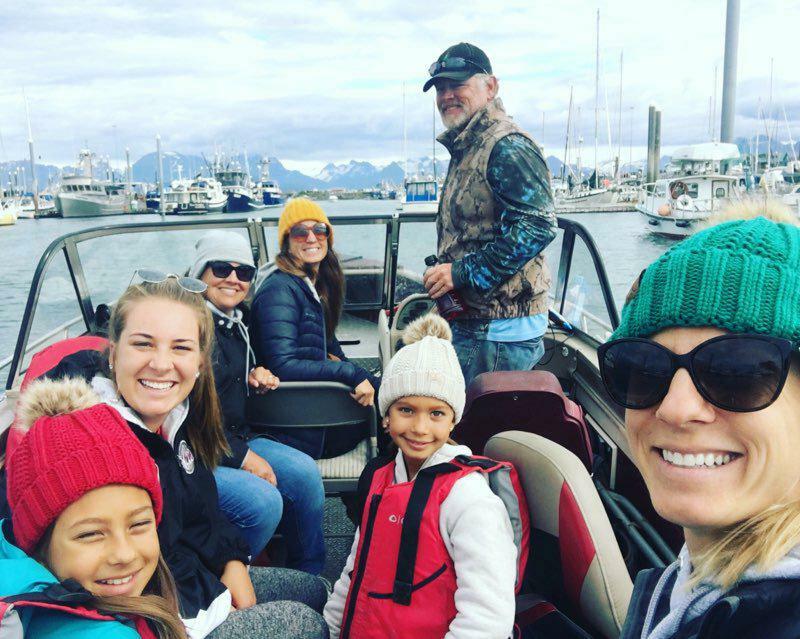 When you come to Alaska, whether it’s once a year, or once in a lifetime – you have an opportunity for adventure. What are you going to do with it? It always amazes me that some sit about the house and stare out the window – as if they have no idea what to do with themselves, clueless about the opportunities that abound out there, and the best thing they can come up with to do is watch TV in their room, or go shopping on the spit. There is an inkling of desire there, looking out the window, but they lack action. In other words – passivity. Lack of creativity. Domestication. But people were made in God’s own image, and God is some kind of Wild Thing – I know this, cuz, well – look at his creation. And if we are going to live in His image, then we must live from the heart. Here’s an example of some who didn’t look out the window and wonder. Instead, they dealt with just a little hardship, made the best of it, and made a memory that may just last forever. We didn’t worry that the 20 foot Lund was too small for 7 people. We got out the lawn chairs, and crammed in behind the windshield real, real cozy like. We didn’t worry that it was too bumpy out there. We embraced it for an amusement park ride it could be. We didn’t question if we could get wet. We put on rain coats. And, we didn’t worry that we would miss dinner. We brought snacks, and had a late one at home. So often, I see these kind of small inconveniences keep our guests from going out. Well, stay comfortable then, folks – but you are missing life and it’s abundant opportunities. 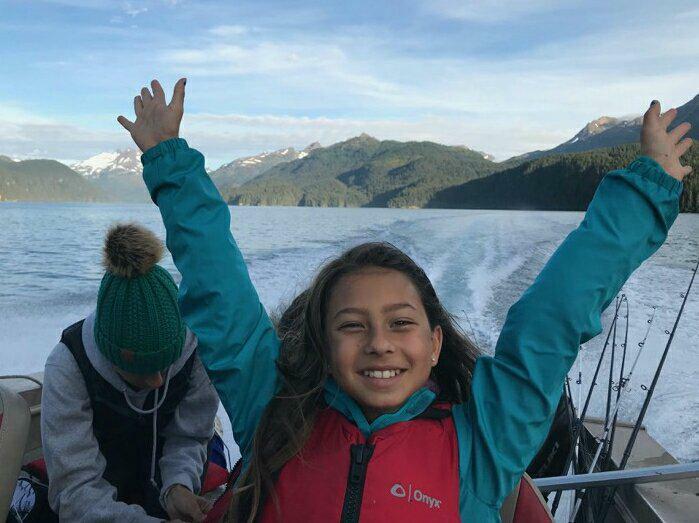 Read through this photo montage and their captions, and always remember that this could be you on a Majestic View Adventure! Look up Maria for reservations to stay at our B and B, and look me up, Captain Tim – to set up your custom made trip today! 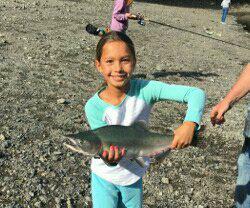 Kaleah, age 8, was able to wield her own salmon pole, and cast, snag, and reel in her own fish. Needless to say, I was impressed. Way to go Kaleah! What can I say about Mandy? Overall, she was not too much trouble, but there was that one time that she yanked real hard while I was walking by, and I took the brunt of her snagging hook on my inner thigh! Poor timing on my part, and a close call, but the hook didn’t stick. I yelled like a girl and made some good drama out of it, and we had a good laugh. Here’s Mandy with one of her many, many fish. 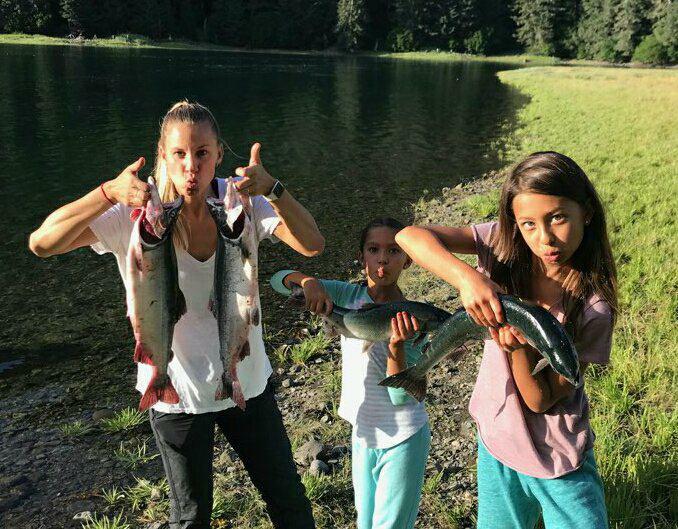 Tracy and her two girls – Kaleah (8) and Brooklyn “B” (10) show off some salmon. I was told that the young girls were competition swimmers. Well, that helped them to fish IMMENSELY. The strength in their upper bodies and arms was amazing. 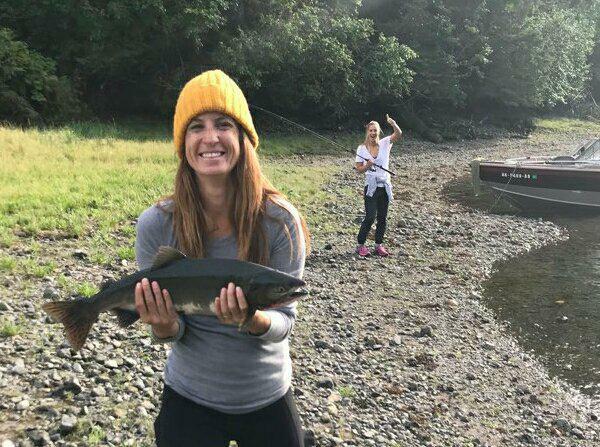 Many full grown women cannot wield an 8 foot pole, let alone pull in salmon after salmon. The fact that these two could, all by themselves, with little or no experience, and little training? Amazing! And mom? She was great too! Leaving the harbor, someone got out their cell phone for a selfie. What a great shot. Way to make it happen ladies! 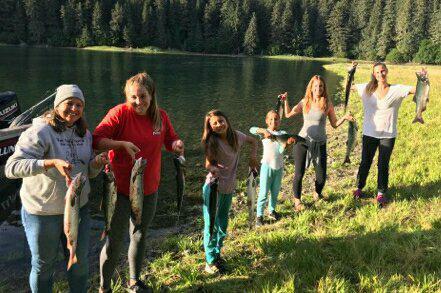 This is a second time I have taken 6 ladies fishing this summer. Both times were a blast! And look at our playground in the background. Beautiful! I knew I couldn’t fish 6 ladies out of a 20 foot boat, so we beached, and fanned out on this shoreline. 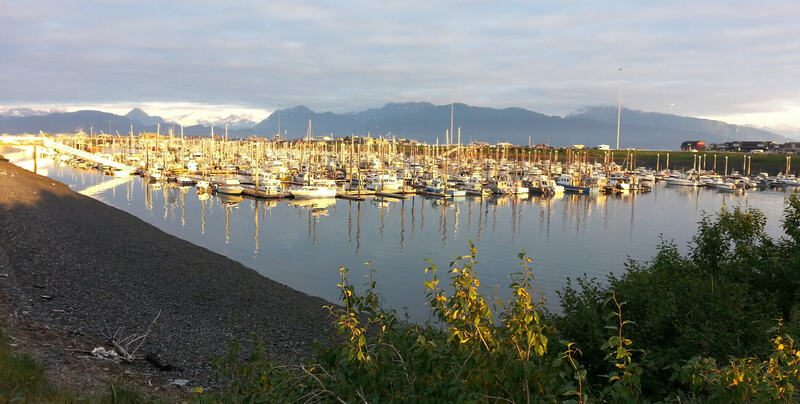 I ran up and down the shore – unhooking fish, releasing fish, bonking fish, fixing tangles and snags, retying, and so on. By the time we were finished, I must have handled a hundred or so. We kept 20 bright ones to send home for dinner. 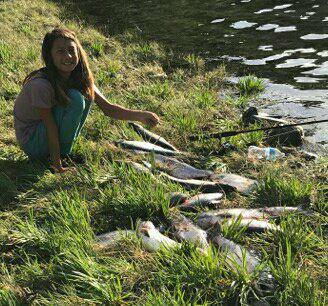 The ladies posed with some of their fish, some a little squeamish, but all were game! What a great time. What a beautiful, magical place! 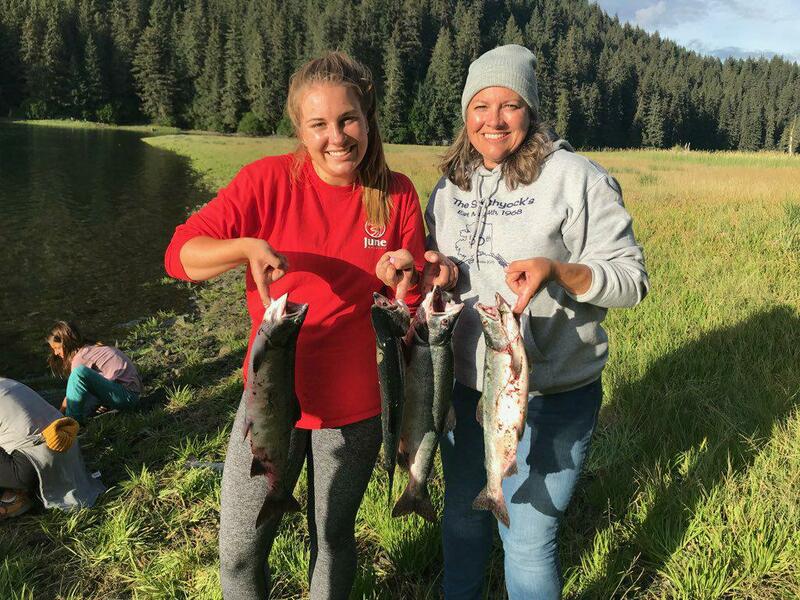 Amy and Allie, mother and daughter, pose with some of their catch. Allie started out rough, but was most improved – I thought. Amy wanted so badly to contribute “bright fish”, but kept catching the “skanks” one after another. Cool fish just the same. And some people take handling fish for granted – as if everyone should be expected to do so. What I like is when someone – with everything in their being telling them not to touch a fish, will take up the challenge, step out of their comfort zone, and do it anyway. This would be like me going to New York, attending the opera after eating Tai food – It probably ain’t gonna happen – SO, way to go ladies! “B” poses with some of the catch. They were coming in so fast, we just bonked them and made a pile on the beach. “B” doesn’t stand for “Brooklyn”, it stands for “Beast”, cuz when it comes to fishing, she was one! Tim, we had an absolute blast fishing with you! An unforgettable day for sure, and a highlight of our two week vacation in Alaska! Thank you for being so patient with all us girls. It’s obvious how much you love what you get to do in that beautiful place. And the Majestic View was beautiful & amazing! What a great view! Thanks to you & Maria for making it such a fun part of our trip! Our freezer is full of salmon!